An increased dynamic range and less general distortion means the sounds you capture come through loud and clear. From a whisper to a scream, CORE microphones exhibit increased clarity and openness in the sound across all SPLs – from low to high. 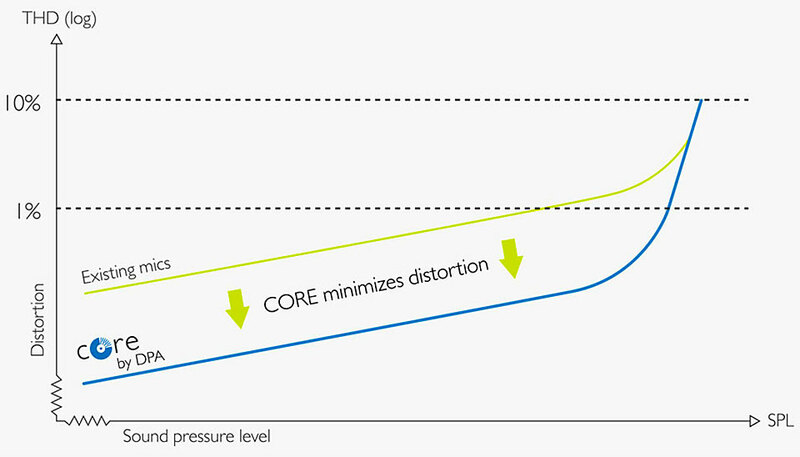 By increasing the dynamic range of the mics, CORE by DPA extends the point at which the distortion is measurable. Actually, CORE by DPA lowers the general distortion heard at all levels – from soft to loud. That means a clearer more open sound across the entire range. CORE by DPA increases the dynamic range of d:screet™ Miniature and d:fine™ Headset Microphones up to 14 dB depending on the specific type of capsule. This means you can capture a wider range of sounds all the time trusting that the resulting audio will sound clear and natural. You may want to check your speaker volume before pressing play, or put some decent headphones on, especially on the “SHOUT” recording. These are the raw WAV files (24bit / 48KHz), recorded sequentially with no EQ or processing applied. They were recorded in our live room at Sound Network and are intended to show how DPA CORE technology handles a dynamic performance with ease, producing clear, undistorted audio. What Exactly Does DPA CORE Technology Do? 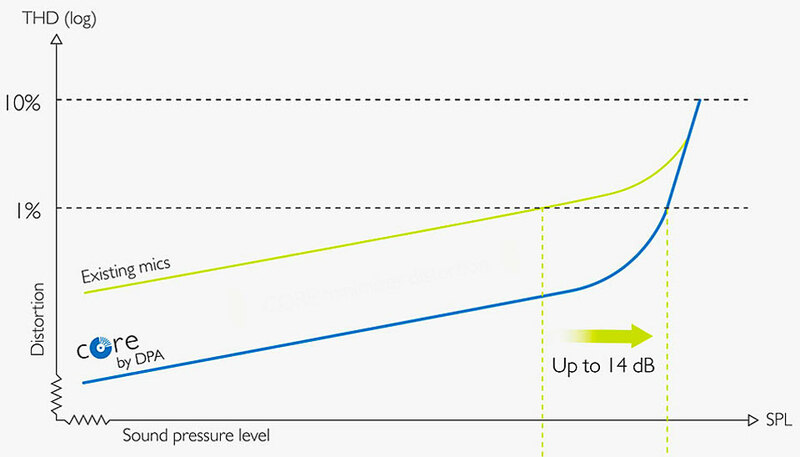 For example, the dynamic range of the d:screet 4061 and the d:fine 4066 has been increased by 14 dB at 1% THD. What this means in actual fact is the ‘CORE’ amplifier technology ensures the point at which distortion becomes noticeable has been moved way up the dB range, giving a more clear and open sound throughout the whole level range; from a whisper to a scream. DPA is renowned for its high-quality, clear and natural sounding microphone solutions, the new ‘CORE’ technology does not replace our existing beloved mics, but rather offers another choice to our worldwide customer base. We want to give our users every option imaginable to capture the sound that they require during any type of production; live sound, theater, film recording, etc. DPA is excited to provide this new, leading-edge solution that while unseen to the eye, can be heard very clearly by ear. Located in the capsule of its miniature mics, DPA CORE amplifier technology is currently available in the d:screet 4060, d:screet 4061, d:fine 4066 and d:fine 4088 mics. Microphones purchased with the new technology will come in CORE packaging and will have a blue label near the serial number on the cable to differentiate between these and the original versions. A very discreet laser engraving stating ‘CORE’ has been incorporated at the microphone capsule as well. The remaining d:screet and d:fine microphones and full range of color options will be available with ‘CORE’ technology in early 2018. The new DPA CORE omnidirectional microphones will also provide water and moisture resistance through nano coating and hermetic sealing of the sensitive electronics. As a company, we always want to maintain our core values through the solutions that we present,” continues Mørch. “With the announcement of this new technology, we are staying true to our company roots by providing our customers with an enhancement to the absolute finest microphone solutions on the market today. All DPA CORE mic capsules will be recognisable thanks to a small “core” laser-etched into the base of the capsule housing. Or search the full list of CORE by DPA dealers and rental partners. Please get in touch with any questions.